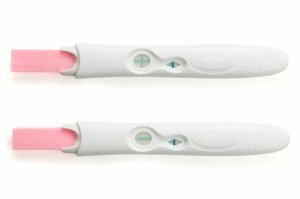 HCG Levels in Twin Pregnancy - Is it an early sign of multiples? 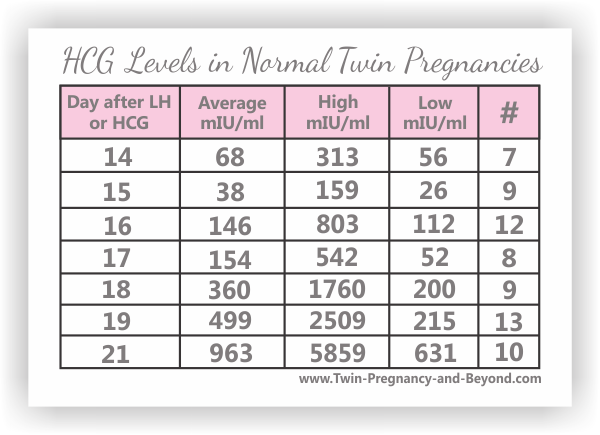 There are generally higher HCG levels in twin pregnancy, although they are not necessarily doubled as you might imagine. HCG (human chorionic gonadotropin) is a hormone produced during pregnancy that can be detected in the blood or urine even before the mother misses her period. This hormone doubles about every 2 to 3 days and reaches its peak between 8 and 11 weeks of pregnancy. And you guessed it, it's also what is detected in an over the counter pregnancy test. 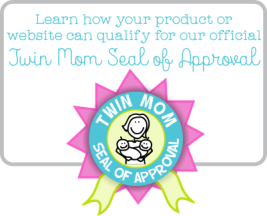 "In general, HCG levels are higher for twin gestations, though definitely not doubled as one might expect. In addition, many singleton pregnancies have high levels for many other reasons. Therefore, there is no set rule about checking for twins based on HCG, but there really doesn't need to be, since these patients are being scanned for whatever their underlying concern is anyway." The chart below features some sample levels for comparison. Discuss your own results with your doctor, midwife, or other healthcare provider for the most accurate information regarding your unique pregnancy. Dr. Richard Sherbahn and is for informational purposes only. So, if you're newly pregnant and are wondering if it's twins due to higher HCG levels, your OB will likely be doing some further examinations to confirm or deny this. Remember, just one HCG reading is generally not going to provide enough information to make an precise diagnosis. Multiple readings will give a more accurate picture. However, an ultrasound or sonogram would likely be the next step as it's the most reliable way to confirm a twin or multiple pregnancy. Could you be having multiples? Find out your Odds Of Having Twins!